No Mess, No Sticky Hands! Cuts garlic with a simple twist in just seconds! Garlic Master, as seen on TV, is the cutter that cuts 81 perfect cubes of garlic with a simple twist. Garlic Master's stainless steel cutting grid features 16 razor sharp blades and a second blade to create the perfectly cut cubes of garlic. 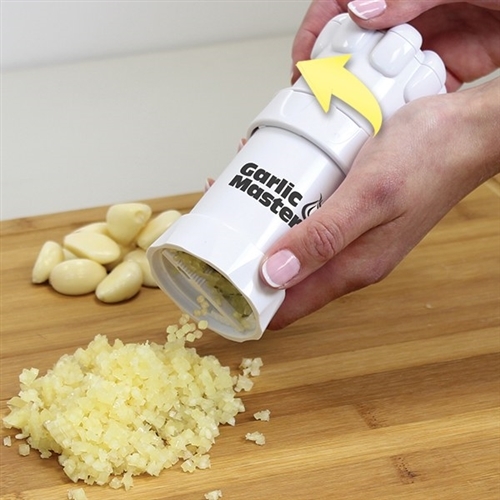 Simply place peeled garlic cloves in the Garlic Master and then twist. Cut garlic cloves in just seconds with Garlic Clove. Store your garlic in the fridge with the handy odor free storage case. 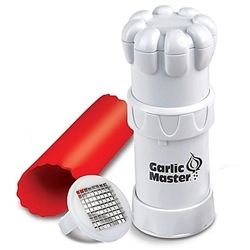 Garlic Master includes the bonus easy peel silicone peeler- simply roll and peel cloves.